This is an In Person Signed Colour Book Page from a Tennis Book Publication approx 10.5 x 8" of the former Croatian Tennis Champion. He is the only Player ever to win Wimbledon on a Wild Card entry which he did so memorably in 2001. Goran Ivanisevic born 13 September 1971) is a retired Croatian professional tennis player. He is best remembered for being the only person to win the men's singles title at Wimbledon as a wildcard. He achieved this in 2001, having previously been runner-up at the championships in 1992, 1994 and 1998. 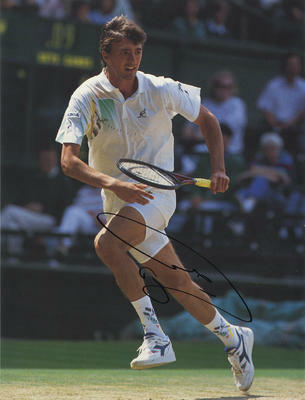 Ivanisevic is famous for his strong serve, which is considered among the greatest to date. His career-high singles ranking was World No. 2 (behind Pete Sampras) in 1994.